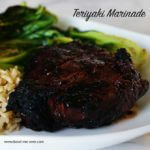 Teriyaki Marinade - simple, super flavorful and so delicious, it's an easy way to bump up the flavor in steak, chops or chicken - love it! Combine all ingredients in a Ziploc bag. Mix well and add meat. To be safe, I put the Ziploc bag in a large bowl in case it springs a leak. Be sure to remove the meat from the refrigerator for at least 20 minutes prior to grilling. Marinade 2-3 pounds of steak or chicken about 2 hours, turning occasionally. If using shrimp or tofu, reduce marinade time to 20-30 minutes. Grill & enjoy!